VICTORIA, BC – Anawim House’s Collaborative Community Art Show will bring the community together in artistic expression to raise both awareness and funds for Anawim House. Anawim helps Victoria’s homeless and those living in poverty by providing drop-in services and transitional living. 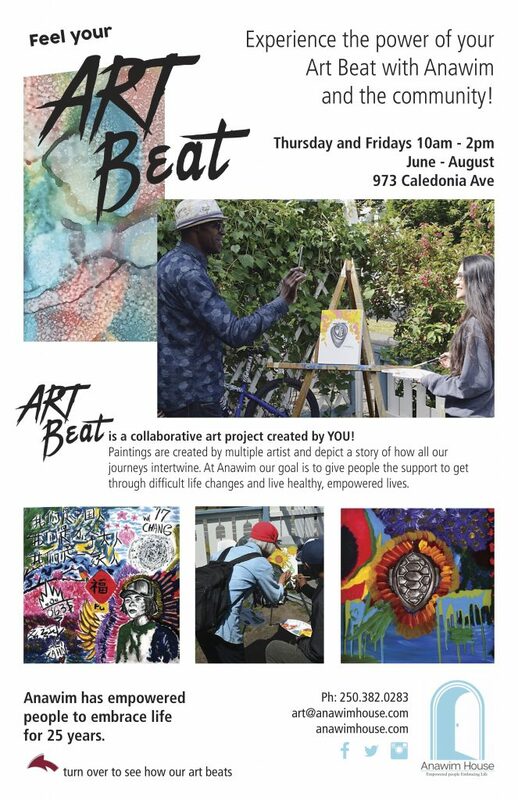 Anawim’s Collaborative Community Art Show will be held on Thursday, August 31st from 7:30 pm at the Public Market at the Hudson 1701 Douglas Street, Victoria. The display and auction continue through September 10. “The aim of the art show is to bring our community together and prove that we are all equal, we all have hopes, dreams, and voices that need to be shared.” said Anawim’s Director, Terry Edison-Brown. Throughout the summer, canvases have been set up for everyone’s participation outside Anawim House and at community events. The canvases began their journey as sketches created by art students from St. Andrews School and the street community who access Anawim’s services. The images represent life, empowerment, hope, and growth but start as dark, charcoal shadows until the supportive community paints colorful life upon them. During local events like Pride Parade, Moss Street Paint-in, North Park Festival, and Harbour Cats’ games, the canvases were set up for anyone to paint on. They will also be available for participation at the Hudson up until the final gallery showing as Anawim continues to bring the topic of homelessness to a diverse cross-section of the public in Victoria. As each piece has developed, the record of names, photos and stories have grown, so that on the day of the Art Show, the exhibit will document how the members of the community have added to its life, colour, and beauty. The pieces will complete their journey at the art show, where they will be auctioned off to raise funds for Anawim’s programs. The images represent life, empowerment, hope, and growth. “Last year’s show was a great success and brought an enormous sense of pride to the street community, showing there is a community for them and we, the people of Victoria are it.” said Rob Hurst, Manager at Anawim House. This year’s show represents the theme “Empowered Life” and expresses inspiration and unity through at least 30 canvases that will be turned into beautifully painted stories with the help of Anawim’s friends, partners, and community supporters. Each piece has developed as individuals add to its life, light, and beauty. Anawim’s hope is to bring the community together to promote awareness and create conversation on issues of poverty and homelessness, and to bring attention to the importance of services offered at Anawim House.